NEW YORK (AP) It was a soaring idea, intended to put the city's least-populous, least-visited borough on the tourism map. But six years after it was announced, a plan to build one of the world's largest Ferris wheels on Staten Island is still stuck on the ground. The four pedestals for the wheel, each weighing 100 tons, remain the only components of the 630-ft. structure erected to date on a site on the Staten Island waterfront. The project, originally budgeted at $230 million, has been mired in cost overruns, delays and disputes between investors. 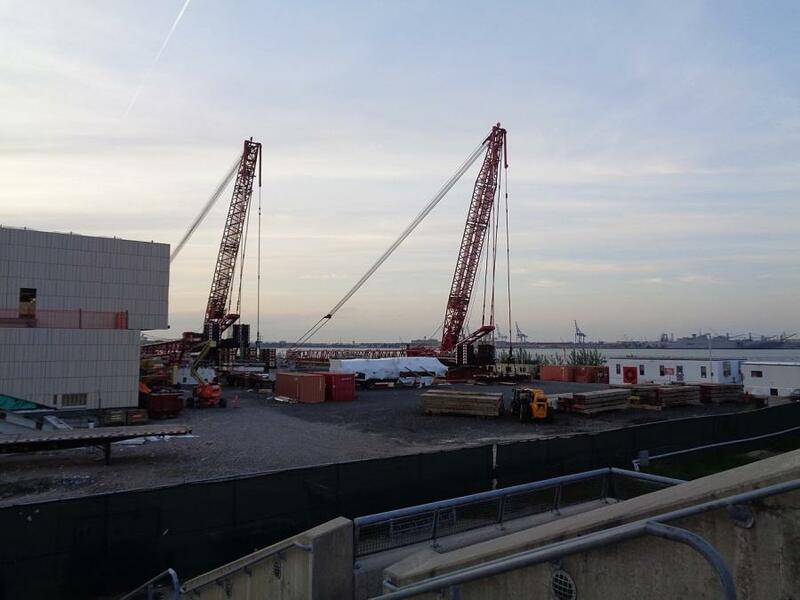 Work on the New York Wheel has been stalled since May of 2017 when the main contractor halted work and was fired. The proposal got a glimmer of hope recently when New York Wheel LLC, the company behind the project, reached an agreement with the contractor, Mammoet-Starneth, to resolve some of their legal disputes. The agreement, filed with a bankruptcy court, gives New York Wheel until Sept. 5 to either restart the project or cancel it. “This settlement will allow New York Wheel the opportunity to finalize its financing arrangements and re-commence the construction and completion of the Wheel,” the developers said. New York City officials say they still are confident the wheel will succeed. “We are pleased to see these positive steps taken with the wheel, and look forward to this transformational project adding to the swell of new jobs and economic growth we're seeing in the area,” said Ryan Birchmeier, a spokesman of the city Economic Development Corp. The New York Wheel was one of several giant Ferris wheels planned for sites around the world following the successful opening of the 443-ft. London Eye in 2000. New York's wheel was the soon-to-be world's tallest when it was announced in 2012. Its projected height has since been surpassed by the 689-ft. Ain Dubai or Dubai Eye, now under construction in the United Arab Emirates. Staten Island, the place where the wheel is supposed to be built, is both physically and culturally separated from the rest of the city. Tourists do visit, most coming from Manhattan by the Staten Island Ferry, which offers a free jaunt across the harbor past the Statue of Liberty. But many tourists go for the breathtaking views of the harbor, turn around and come back without ever leaving the terminal. Officials had hoped the giant wheel would entice more people to get out and walk around. Staten Island shop owner Ed Varuolo opened his business, Hypno-Tronic Comics, near the wheel site in 2013, in anticipation of foot traffic. He still may benefit from a related project on the Staten Island waterfront, an outlet mall with separate developers and financing that is scheduled to open nearby this fall. While several observation wheels inspired by the London Eye have been built in the last decade, including the High Roller and the Singapore Flyer, others including the Beijing Great Wheel , the Great Berlin Wheel and the Kolkata Eye were announced but have been canceled or postponed due to financial obstacles. Speigel sees the New York Wheel's location on Staten Island as a disadvantage. New York Wheel has tapped American Bridge Co., the 118-year-old civil engineering firm that built the High Roller Ferris wheel in Las Vegas, as the new contractor, though no agreement has been announced. American Bridge did not respond to a request for comment. Under the terms of the settlement, New York Wheel can void the deal if it fails to secure financing to finish the wheel, whose 2017 cost estimate of $590 million will likely rise. If that happens, Mammoet-Starneth can auction the parts, including the $9 million legs that were crafted in Italy and have been in storage since October 2016. Representatives of Mammoet-Starneth, a joint venture formed by two Dutch companies to build the New York Wheel, did not return calls seeking comment.